Another plugin born out of the need to help improve site functionality for my users. 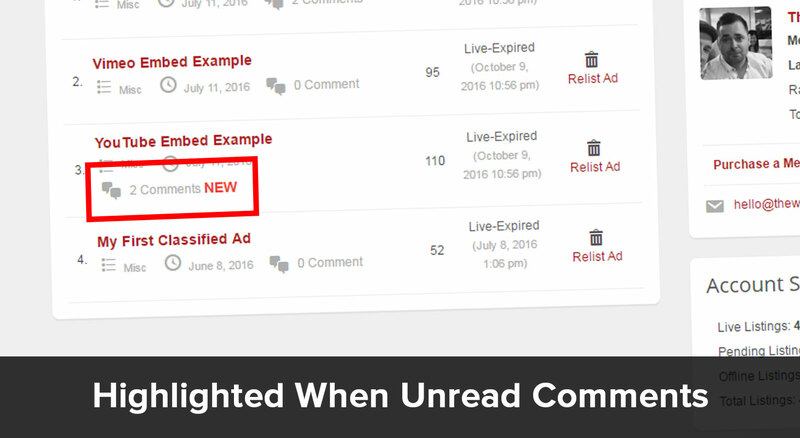 Users of my site were frustrated they did not know how many comments their ads had or if their ads had unread comments. 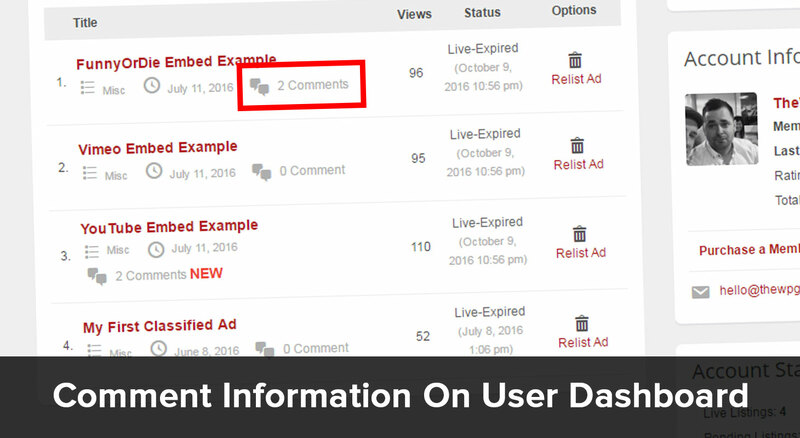 They wanted to be able to go to their dashboard and clearly see how many adverts had comments from users, and which of these adverts they needed to read and possibly reply too. Simple, but powerful and helps improve the user experience. Q. Does this work with my child theme? A. This should work with all child themes. I’m happy to check the plugin on your site. You simply need to Private Message me through the forum with your website admin details and I will test for you prior to purchase. Support will be through the plugin forum. Installed this and activated, does not work, emailed the company twice but no reply back. Does the user receive any emails also? Hey Guys, thanks for the interest. 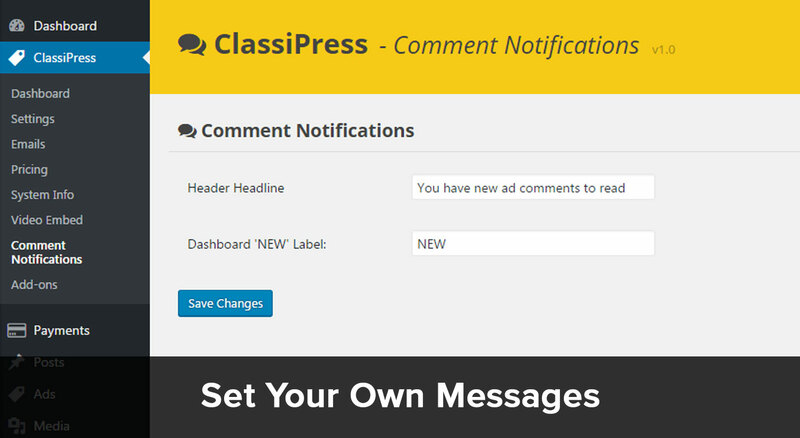 I tested my live Classipress site, and I found that ‘contributors’ and ad owners already received email notifications when a comment was made on their adverts, so I didn’t include this as I didn’t want to double up. However, I have email notifications in another plugin I’ve created (user feedback & search) so adding this wouldn’t be difficult. I just haven’t initially as in my testing email notifications already went out. Are you sure emails don’t already go out for you sites? If not I can certainly look to add this in over the next week or so. Great thanks! Weird how my site emails out, they didn’t go to your spam folder did they? I’ll look to add this option in hopefully this week (got a busy week already, and a wedding at the weekend). I’m also going to make the emails optional. I checked it out and there is nothing. It could be maybe the server that has not yet processed the info. Anyway, I will comment in case it arrives. Plese comment on this post as you update it, so that I get the notification. Btw I love your plugins! Hope you are going to develop others. I’m currently in the process of designing and building a newsletter plugin that lets you send newsletters with your latest ads to your registered users. Well there must be something wrong with my version cause it doesn’t show? not sure how to proceed, using classipress. tried emailing for support but no reply, maybe this is where the support is? I get the email on comments. I think I will try the plugin..
Can this plugin slow down my site in any way? That’s interesting Anders, sounds like your site is the same as mine. I’m going to add the option to include a custom email and have this an optional setting you can enable or disable. With regards to site slow down, no there shouldn’t be noticeable changes. On the dashboard page, it will load as normal and there may be a brief delay whilst it pulls information from the ad to display the comments. You’ll see what I mean in my demo run through video in the description area. Ok, I will buy this plugin. If there is a way to also include notifications in My Dashboard send from the contact form on the ad page (in some way) that would be good. I do not know if that is possible.. However I try the plugin as it is. Because the contact form sends a private email there’s nothing really for the user to ‘read’ on the site. I’ve actually done the above myself with my site, but I’m running a highly modified private message plugin. When buy the plugin it say price (when checkout) $ 0. How can I pay for it…something is wrong there.. I have a picture if you want me to email that somewhere, just let me know. I’ve contacted AppThemes as they control this, but I’ve replicated the issue so looks to be a problem with the marketplace and a setting on there. Hopefully they can resolve soon. Ok Logged in as a different account to the poster. Left a comment. Had to log in as admin as the comment needed approving. Then logged in as poster and no notification of a comment. Do you have moderation on by default? Once a poster has been previously approved for commenting they shouldn’t need approving again. If you post a comment as that poster again you should get the notifications. Hey @Dale Miles, did you implement the email notification? Can’t wait for it! After further testing WordPress sends out emails when someone comments on an ad you own already, this is already a basic function of WordPress. If I add this feature in, it’s only going to duplicate the emails sent. If you’re not receiving emails from WordPress, then adding this option isn’t going to fix that as the emails would still be sent via WordPress. If you’re having trouble with email being delivered from WordPress to your users, then I would look at installing a SMTP WordPress plugin. Your plugin works perfectly and there are no problems. I just have a quick question. 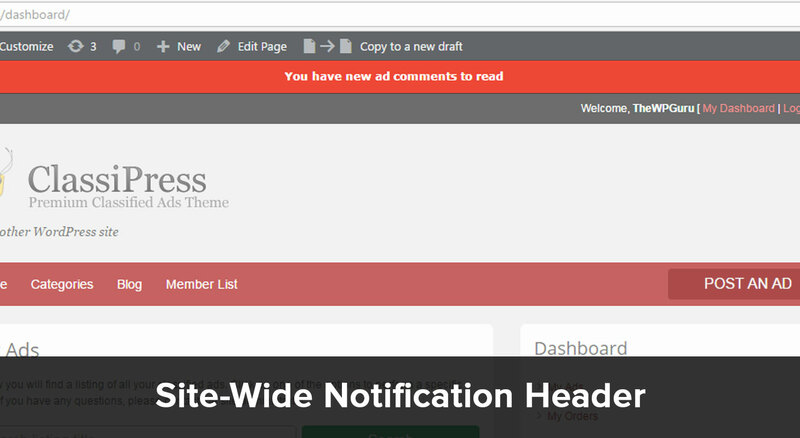 Can your plugin somehow have a notification for blog comments? 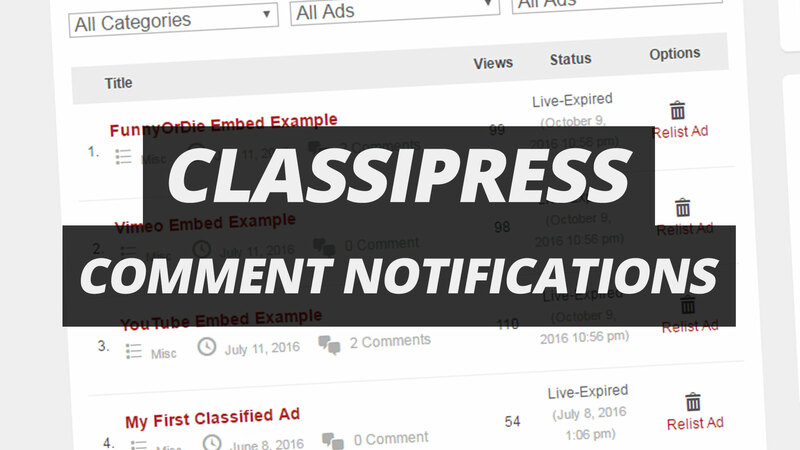 I use the classipress/wordpress blog functionality along with another plugin to allow users to post. Like the problem you solved where no one on the site can get notified if someone commented on their ad, can you do something about the blog? Is there like coding or a potential update that can fix this? I want a notification heads up not neccesarily the top bar like your plugin but anything. I want them to be able to click the notification alert and get redirected to their post homepage that says” New” for their post. I’ve been searching multiple days for a plugin like yours but for blog comments. Hi is this plugin working for newest 3.61 classipress? Como eu ativo os comentários na página principal do wordpress. Dentro do painel do usuário aparece o ícone comentário mas na capa do meu site não. Allow users to embed video from YouTube & Vimeo into their ad listings.